The Council appreciates the wonderful volunteers who work beside staff to enhance our services. 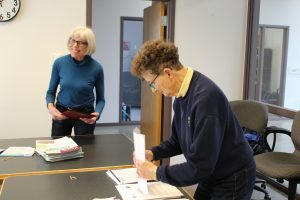 Volunteers share a variety of talents including gardening, voice recording, and archiving the Council’s history. No matter the project, our volunteers put their heart into it! Thank you for generously giving of your time and talent in support of the Council. If you or someone you know has an interest in volunteering, visit WCBlind.org to learn more about available volunteer opportunities.